I’m a sucker for an art-for-art’s-sake stance, but given my background in daily journalism I cannot easily accept John D’Agata’s defense of changing facts in About a Mountain as his artistic right. He says art tricks us and that he practices art, not traditional essayistic nonfiction and certainly not journalism. Apparently he calls About a Mountain a book-length lyric essay. 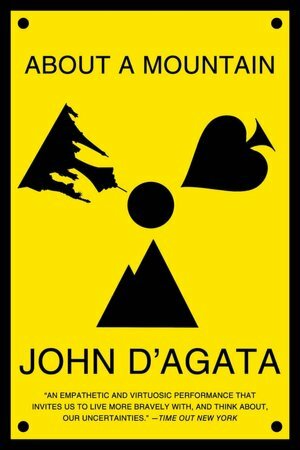 But to reasonable people About a Mountain presents itself as a nonfiction inquiry that melds D’Agata’s righteous probe of nuclear waste disposal with details of Las Vegas’s strangeness and an account of his and his mother’s relocation there. He increases the perception that his book is journalistic by dividing it into these chapters: Who, What, When, Where, Why, How, Why, Why, Why. That stream of screaming whys is damn good, let’s face it. And, again, it reinforces the sense that like any good reporter D’Agata is a stand-in for us. He’s a stand-up guy on a quest to get at truth. Maybe he’s playing with a journalistic approach to rub our noses in the shallow, obtuse nature of traditional journalism that preserves the status quo even as it ostensibly attacks it. But in doing so he’s also trading on the legacy of journalistic martyrs. From 1960s Mississippi to today’s Syria, reporters have endangered their lives to file their reports. They’ve died trying to get mere facts, like how many innocents were vaporized in a bombing. They’ve struggled to place those fatalities in a larger context, tried to show a brutal pattern asserting itself. They’ve suffered to assemble meaning from random shards. To give faces to the dead, to transcend mere facts, to carry the awful truth of human tragedy into our hearts. It bothers me, to see anyone appear to mock that. For instance, D’Agata portrays Congress debating whether to make Yucca mountain a nuclear dump, and, as if in response, a sixteen-year-old boy makes a suicide leap off the balcony of a cheap Las Vegas hotel. In a review for The New York Times Book Review, novelist Charles Bock excoriated D’Agata for changing the date of the boy’s death to better serve his narrative (D’Agata gave the correct date in a footnote). The book indicates that D’Agata worked hard in a journalistic way, collecting data and even visiting the boy’s family, but he changed things here and there, in this instance not only the boy’s suicide date but also the fact that at least one other person in Las Vegas took his life in the same way that day. To me, the problem isn’t solved by a footnote saying, Hey, this part of my gorgeous prose is a lie, but since I admit it, you can still trust me. Rather, it damages the moral authority of D’Agata’s voice, which is his narrative’s main engine. It causes me to question the particulars of two other important scenes that, according to endnotes, were actually composites—a visit to a mall and a tour of Yucca Mountain. I don’t know what to think. What’s specific or representative or smudged? Pandora’s box is wide open. I agree of course, and don’t see how using the boy’s actual date of death would have undercut D’Agata’s saying he emotionally associated it with another event—if that’s true and not another pose. The purpose of persona is to reflect and to reveal self and its reaction to the world, in this case Las Vegas’s and America’s damaged soul, thereby treating readers as friends or partners instead of as foes or stooges. And besides, it just feels wrong to use that kid, poor Levi who solved his temporary problem permanently, as a narrative prop. To deny him the dignity of his choice to die on a particular day. Real journalism is far more humble than that; it says, I don’t know the significance of this fact, this date, this brand name, but maybe it will mean something to someone. Maybe the day he chose to die meant something to Levi. Surely D’Agata is an outlier. But this flap has implications for how nonfiction practitioners are enculturated, especially since the rise of creative nonfiction as a popular major in English departments’ writing sequences. D’Agata himself teaches creative nonfiction at the University of Iowa. It concerns me that kids who don’t yet know the original sin of assumptions—how hard it is to get the most basic facts right in the first place—might think they have license to make up stuff and to change facts, stubborn signifiers of objective reality. Nonfiction has a plethora of subgenres, including reportage, literary journalism, criticism, classical essay, narrative essay, memoir, and the currently popular catch-all and mixed-bag label of creative nonfiction. Having an over-arching rule—don’t make up anything unless you tell the reader or it’s obvious—can make the genre seem lesser, since the only rule in fiction is that it work (not bore the reader). But the sonnet is the result of following rules, and fictions operate within rules the writer chose (such as the ramifications of point of view) and then had to live by. When Lee Gutkind came up with the term creative nonfiction, I think he wanted to describe the genre’s writerly freedom to employ persona and the dramatic storytelling techniques now associated with fiction (point of view, scenes, dramatic structure). Gutkind is most famous himself for his work as an immersion journalist. Tom Wolfe, as the 1970s poster boy for the now-dated label New Journalism, famously expressed contempt for the mere essayist, calling him “the gentleman in the grandstands.” That is, someone too refined and timid to talk to people and report. Someone who misses the real story of what real people, civilians, are doing and saying and thinking because his gaze is directed equally between the oh-so-distant parade and his own fuzzy navel. But while immersion is the hallmark of all great writing, some can produce art by immersing in themselves alone. And while Wolfe was a great reporter, personally I can tire of his persona: always aping the alleged point of view of his subculture subjects, whether Black Panthers, test pilots, or NASCAR drivers, who always sneered at the uninitiated in the same voice. I enjoy seeing a real human put on his big boy pants, stuff a notebook in a back pocket, and wade into the impersonal world on some heroic, ennobling quest. That’s what I thought D’Agata was doing, and I admired him for it. There’s a self at work, and we see it grapple with everything that’s not-self, see its limits and its biases and its internal conflicts. But that self is trying to get the objective world right. Restoring persona to reportage makes the process transparent and makes the reader an ally. The writer can be a blunderer who makes his fear and confusion and flaws a theme, but he cannot be an unreliable narrator, at least not in the same way that one in fiction can be. We must believe, whatever the charms of his damage, that he’s trying to get at truth through hard internal and external inquiry. His character must stop short of being or appearing to be sociopathic. Giving D’Agata the benefit of the doubt here—he’s so young, such a wunderkind—rather than institutionalizing him, and since he already is sequestered in academe, if I could I’d sentence him to three year’s hard labor on a small American daily. Johnny D’Agata, cub reporter, would cover city council, two school boards, the cops, and, oh, all high school sports. Since I have magical powers here, I’d also put him under my scariest editor from my newspaper days. It would cure John—if choleric Bill, forever seething and red-faced, didn’t strangle him first. An extremely edifying post. The rules and regs of non fiction writing have to be continuously honed and monitored by folks like you. Keep it up, Richard, I depend on you. This is reminiscent of those articles and books by journalists which love to castigate writers of literary nonfiction for not “sticking to the facts.” Like them. Only trouble with that is that “obective reality,” is an oxymoron, even if some journalists didn’t get the memo. I feel that this post spends too much effort trying to jam D’Agata into the procrustean box which measures “just the facts” journalism against a creative genre. Of course D’Agata–and all other LNF writers should be straight with their readers: let them in on what is “invented” and what is not–unless its obvious. We do, though, need to cut LNF some slack, suspend some disbelief in an effort to get under the existential covers, figure out what the facts and events mean. Thanks for giving the other side, Richard. I do feel, however, that his book is being judged very naturally against the traditional essay tradition and the understanding of journalism that’s by now in everyone’s DNA. I spent a long time in the last post showing the flaws of the objective style, and no one who practices it is unaware that truth, as Kierkegaard said, is subjectivity. One of the reasons that people suspect journalists is that style, because it implicitly denies there’s a shaping intelligence, when of course there has to be. D’Agata’s new book seems very obviously to me a performance, from the excerpt I have read, and a clear and open exaggeration. I am surprised by those who are shocked when told it’s hyped up for impact or art. I just think the Yucca mountain book presents itself as a sincere inquiry, if artful. I wish you’d reply with a definition of the lyric essay (LNF?) because no matter how many times I read the definition of the lyrical essay I can’t remember what it is, and please say if you can why lyrical essays need a new subgenre with its own rules. I appreciate the idea that writers are responsible for having a ethical base for what they do and why. I don’t buy the idea that creative nonfiction has license to massage facts in the service of some larger truth. Both are better served and elucidated when respected. Words have cultural impact, and those who function as authors are accountable for the cultural work that their words do. D’Gata may write engagingly, but if he must disregard reality in order to serve his version of the “truth,” I no longer care what he has to say. Why not just write a novel, then? Nonfiction authorizes its creator to speak in a way that fiction does not, and D’Gata seems intent on enjoying the privileges of being a writer of the former while, for all practical purposes, serving as a writer of the latter. After all, most writers can come up with pretty narratives that shore up what they would like the truth to be within a specific set of given circumstances if accuracy is not an issue. Much more valuable — and beneficial — is a narrative that grows out of experience itself, that acknowledges fact, and that defers reflection and interpretation in order to allow the experience to affect and alter one’s existing assumptions about the world. It’s hard to understand how D’Gata can maintain and defend his equivocal stance on fact vs. truth without a very deliberate, preconceived notion of what he wants to accomplish with a particular story and why. Making real discoveries would seem difficult in such an environment, which is why the ones he presents to us no longer seem relevant, no matter how well-constructed. Re the definition of the lyric essay. Hard to imagine that a professional writer and teacher would seriously ask an ingénue like me what this form entails. But here goes. The simplest definition I can muster is that lyric essays are a hybrid of the personal essay form and poetry. Since Literary Nonfiction forms (memoir, personal essay, literary journalism, lyric essay) have no fixed or clear boundaries they cross these arbitrary and artificial categories all the time. Other characteristics of lyric essays include: a feeling of beauty or wonder provided by the lyrical voice, reflection, deep subjectivity, and a focus more on language than story line. As with all or most LNF forms, the principal requirement of lyrical essays is the search for meaning in events, facts, and experience. The “ethical” imperatives are the same across all LNF categories: respect the readers, let them in on what has been imagined or tweaked in some way. Thanks, Richard. That’s as good a definition as I have read. But when I look at actual things called lyric they vary wildly. For instance, some are teaching personal essay-journalism essays like Wallace’s “Ticket to the Fair” as lyric. Or Didion, since her persona is so strong, I guess, and so emotional. And I simply cannot see D’Agata’s book as lyric, for whatever difference that makes, but although I bought it long ago I have only read passages (it has kept sliding lower in my TBR pile for obvious reasons). So I don’t know whether what he was slammed for in the NYTBR, for changing the boy’s death date, which he admitted in the book, is something he did with all the other factual changes he has recently highlighted in The Lifespan of a Fact. Someone told me he did, but that’s hard to believe, given the reviewer’s reaction to the one change, but maybe he missed the pattern. If so, I realize, I may adjust my dark view of what D’Agata did, since, as you say, it is a matter of somehow letting the reader in. I sat down and read the notes at the end of the book today. A tedious exercise, but strange and perplexing. They do not appear to contain all the inventions he’s since written about in The Lifespan of a Fact, but the notes address the issues he apparently felt were significant at the time. The appearance of the notes gives an overwhelmingly sincere impression, that of a very hard working and intellectual reporter. Almost no one would bother to read them in the first place, since they are not flagged in the text, per each item, but done by page number in the back. He does finger his characters and trips that were composites, issues that don’t bother me personally since his means (many events over a lot of time) and motives (representative tour guides, for instance) were clear, but the changes around the boy’s suicide bothered me as much as ever. In the text he says “there is no explanation for the confluence that night” of the Senate vote on Yucca mountain and the boy’s death, and then reveals in the note that there was no confluence at all. Probably the oddest thing I found in the notes is that a congressional act “which is one page long” in the text was “actually only two sentences long,” we learn in its note, and I can’t for the life of me understand why he changed that in the first place. It seems perverse and almost self destructive of him, given how hard he obviously worked on the book and how beautifully constructed it is.